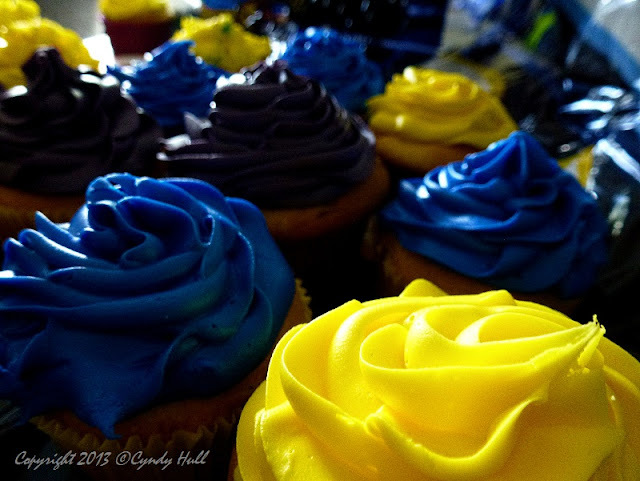 The school colours of recent family graduates translated to some seriously staining cupcake frosting. My mother didn’t bake cupcakes, that I can recall. She routinely baked muffins, which are shaped the same, but have no frosting and are delicious in a more robust fashion. I was in middle school before I ever heard of mushrooms coming out of a tin can - on a good year, we harvested 5 gallon buckets at my grandpa’s farm. Same with wild blueberries - I spent quite a few summer mornings wondering how my Ukrainian baba wasn’t roasting in her long-sleeved sweater as we all filled endless ice cream pails with tiny wild blueberries. And all winter, the fruits of summer graced the supper table with reminders of sweet, balmy days. This was how you managed with 7 kids and plenty of acreage in rural Alberta. Yes it was idyllic in many ways. And guess what? I actually prefer a flavor-packed muffin to an overly-sweet iced cupcake. Me too! Although the occasional red velvet fairy cake with real buttercream frosting can be very satisfying.